Finding the one person you want to spend the rest of your life is the hard part. After that, planning a wedding will seem as easy as pie. Weddings can be a simple affair or a grand event, it is your choice. Celebrity weddings belong to a category of their very own. When a marriage involves celebrities exchanging vows, easy access to different wedding resources is offered by one and all. A celebrity wedding tends to be the talk of the town, with several functions held leading up to the main event. With a limitless budget, any wedding can be turned into the wedding of the century. However, celebrity weddings offer access to services which are otherwise usually barred for the general public, like, mad to order outfits from world famous designers, personalized menus from celebrity chefs, expensive venues and so on. Celebrity wedding decor ranges from the traditional to the modern with the couple deciding on the theme. Interestingly most Indian celebrity couples seem to prefer an ultra-traditional theme for the main events. However, destination bachelor and bachelorette parties are held long before the wedding. Celebrity weddings are usually lavish affairs with an impressive guest list and held at coveted venues. The recent wedding of Yuvraj Singh and Hezel Keech dazzled everybody with a fairy tale wedding. Similarly, another wedding that had the entire town buzzing was when Divyanka Tripathi got married to Vivek Dahiya. Their wedding was made up of many events including an elaborate haldi ceremony, mehendi ceremony and so on. The wedding was covered by the media giving their fans a glimpse into what an ideal Indian wedding would look like. Celebrity couples sig exclusive deals with magazines giving them exclusive coverage of the event. Some of the big hearted celebrities then proceed to donate this amount to charity to begin their married life with a good deed. Unfortunately, heavy security is usually maintained at celebrity weddings to make sure that gate crashers do not create any unpleasantness at the venues. But then again, with great fame, one must pay the price for popularity. Most wedding venues offer tight security to the celebrity couple and their family to ensure that they enjoy this special celebration with no worries. Decorations seen at celebrity weddings can almost be compared to lavish Bollywood set. The venues are made up to look grandiose and fit for the gods themselves. Leaving no stone unturned, the wedding planners hired by the celebrities, work very hard to create a wedding that will be talked about for a long time to come. With customized napkins and linen, a personalized touch is added to the wedding. Most celebrity weddings offer a variety of cuisines to their gust ranging from the traditional to the exotic. The cutlery and glassware used at celebrity weddings are of the best quality. Plastic disposables do not make an appearance at these top notch weddings. 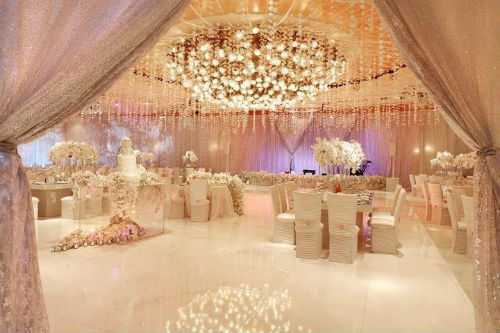 Celebrity weddings usually have a wow factor that takes away the breath of their guests and amazes their fans as well. It is usually the wedding outfit worn by the bride or an interesting aspect of the wedding decoration. 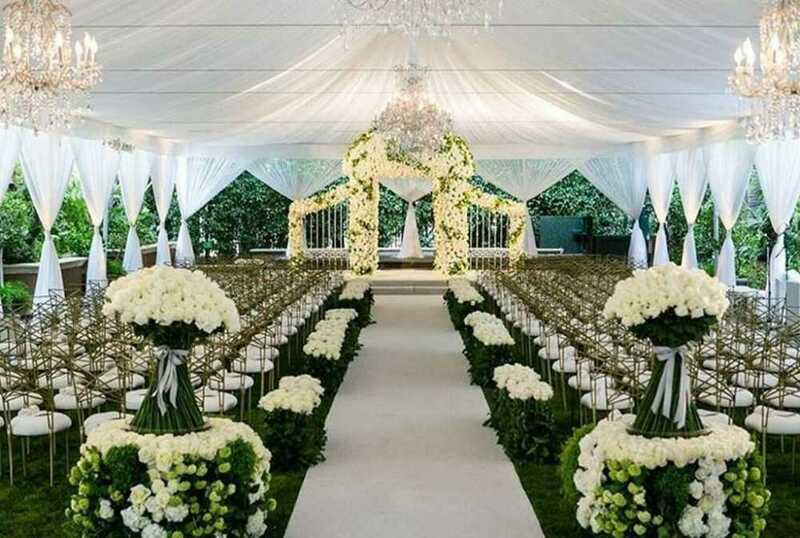 Since celebrities go all out for their wedding, they ensure that the wedding is grand in the literal sense of the word. Chandeliers, huge floral displays, dramatic table centrepieces, these are just the norm for a spectacular celebrity wedding.